Our December meeting will take place on Tuesday December 18th at 7pm!! Doors open at 6:30 if you would like to come early for some pre-meeting sew-cializing! Programming: Our programming this month will be our holiday party, complete with treats and gift swap. 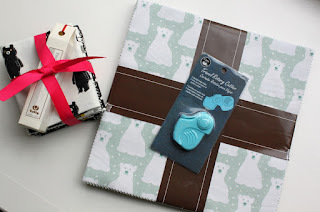 Please bring a modern quilting related gift in the $15-$20 price range. Carolanne has the list of who signed up for treats so another email will go around to those members. 2019 Dues: Your 2019 guild dues are due ASAP. If you've already paid or pay at/before the December meeting you will be entered into a drawing for a $25 gift certificate to Quilted Threads! Our dues for 2019 will be $55. You can pay via PayPal on our membership page or with Cash or a Check at the meeting. 2019 Sewing Bees: Please let Ellen know at the December meeting if you are interested in joining the sewing bee Crew! You can find information about the 2019 bees here. You can sign-up with Cash or a Check at the December meeting. Timna Tarr Workshop: You asked and she's coming back! After hosting a successful workshop with Timna Tarr in 2016 we'll be bringing her back on March 9th for a full day mapmaking workshop. Pricing is $100 for members. You can sign-up via PayPal on our events page or with Cash or a Check at the meeting. We will open this workshop to non-members in mid-January. Shop Hop: Please bring your "passports" from the shop hops earlier this year to the December meeting and give them to Carolanne. She'll be making up tickets for each stamp you have and we'll have a drawing for a gift certificate in December. The gift certificate will be to a local shop of the winners choosing. Giveaways and Raffles: Our giveaway item this month a Dritz Travel Rotary Cutter. Perfect for retreats, sewing bees and sew-ins! 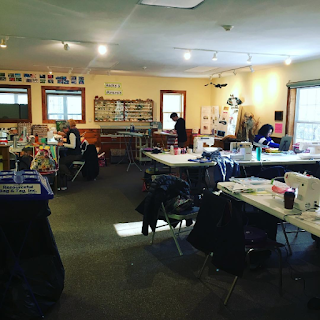 The NHMQG sewing bees are continuing in 2019! These daylong events are held at the Peabody Mill Environmental Center (PMEC), located at the end of Brook Road in Amherst, NH. They are a great opportunity to catch up on sewing projects, prep for retreats, and spend time with your guild mates. To cover the cost, we need to have at least 10 people willing to commit to the six sessions. This will require an upfront payment of $60 for the year. If we are able to sign up more than 10, then the costs will decrease for everyone. The PMEC can hold a maximum of 17 people, so hopefully, there will be a few slots available for people who cannot commit to the full year to join us for an individual session. 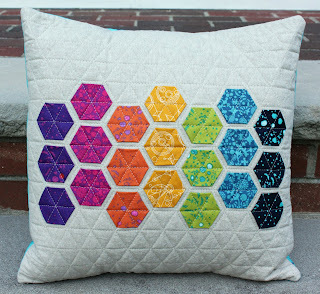 To sign up for the 2019 sewing bees, contact Ellen at edutile (at) comcast (dot) net. The $60 payment is due at the December meeting. There will be a signup sheet at that meeting as well. If you would like to check out the sewing bee setup, you are welcome to drop by our next bee on November 19th and have a look. We are looking forward to another great year of sewing bees! Carolanne shows off her latest seamstress-y completion, made at retreat. 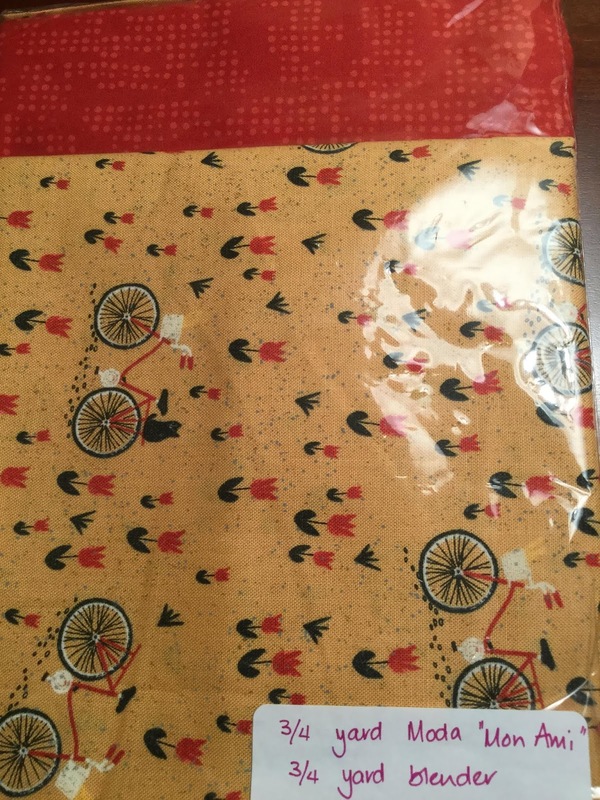 Nice flowery print! Simone pieced this at retreat, very cute boats and passengers! Sarah put together pink square quilt packs with 4 charm packs and 4 yard cuts at retreat. This is a quilt for Sarah's husband, the Meadowland pattern with birds and trees. Fussy and challenging quilt, but looks great! A quilt for Sarah's sister using a layer cake quilted with a loose feather fill on her long-arm. Laurie, new member, showed this fabulous butterfly. She has been involved with MQG's for quite a while starting on the East Coast and then in Colorado before moving to NH. Huge and beautiful! Pat showed this very cute alphabet block quilt and described how it broke two of her sewing machines! This is an incredibly cute cat. Unfortunately your photographer could not pick up a name of the member that exhibited this delightful finish. Brianna showed us her efforts to "branch out" in her quilting with large blocks. Very lovely! Laurie, a new member showed us a gorgeous patchwork double star. Chelsea's Patchwork City finish! 75 blocks - gorgeous. Suzie's cross quilt made from Trish's scraps! Ophelia showed off three quilt finishes and three bags - two months of work. Beautiful on-point set squares. Light yellow quilting thread per Angela Walters advice. Travel bag with all sorts of pockets and made so it can be carried on your roller baggage. Digital patterns for quilting. Back side first! This is the front of the same quilt which came out of a second bag (photographer failed to get good photo of bag). Third bag was made with jelly roll strips wrapped around a batting to create the ropes that are built up to make the bag. A lot of work! Ophelia's third quilt, an asymmetric charm quilt, to test out quilting techniques. René presented a half-square triangle quilt named "Throwing" from a kit bought at retreat a year ago on Cape. Pretty colors with blues and red. Carolanne showed off the results of her coat-making class! Made with waxed fabric. Total of 23 hours of effort. Totally amazing! And she's ready to do another one! Our charity quilt committee and supporting members have been very busy, and have produced an awesome and diverse array of quilts to be distributed to needy children, adults, and families. At our September meeting, the quilts were laid out for all of us to admire. Thanks to everyone who has contributed!!! Our November meeting will take place on Tuesday November 13th at 7pm!! Doors open at 6:30 if you would like to come early for some pre-meeting sew-cializing! Programming: Our programming this month will be a fun night of trivia. We'll break into teams and the winning team will receive an Aurifil Thread box. Timna Tarr Workshop: You asked and she's coming back! After hosting a successful workshop with Timna Tarr in 2016 we'll be bringing her back on March 9th for a full day mapmaking workshop. Pricing is $100 for members. We're trying to get PayPal back up and running, but for now you can pay with Cash or a Check at the meeting. 2019 Board Positions: Nominations for the 2019 board will take place at our November meeting. If you're interested in joining the board please speak up during the business part of our meeting. Voting will be held in December. Shop Hop: Please bring your "passports" from the shop hops earlier this year to the November or December meeting and give them to Carolanne. She'll be making up tickets for each stamp you have and we'll have a drawing for a gift certificate in December. 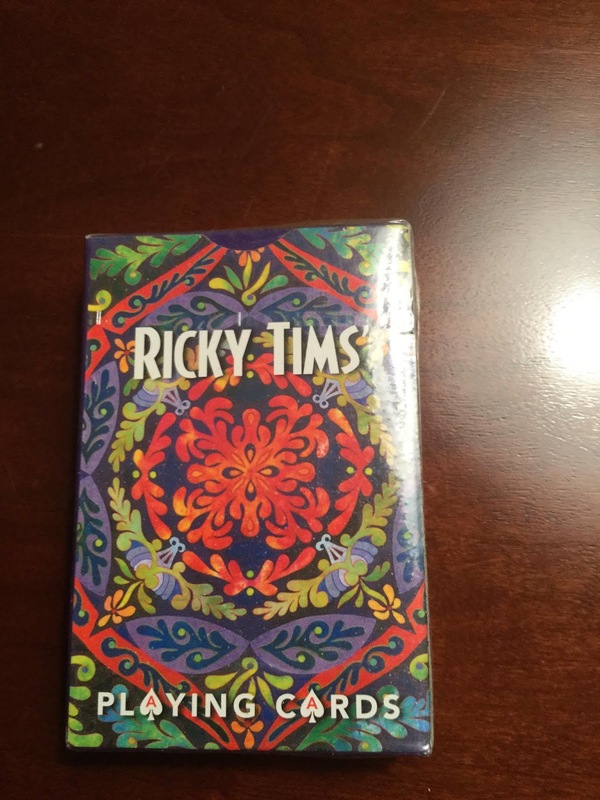 Giveaways and Raffles: Our giveaway item this month is a deck of Ricky Tims Playing Cards. 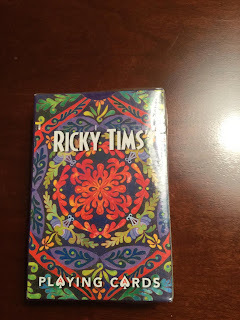 Your next card game will have a little quilty fun! 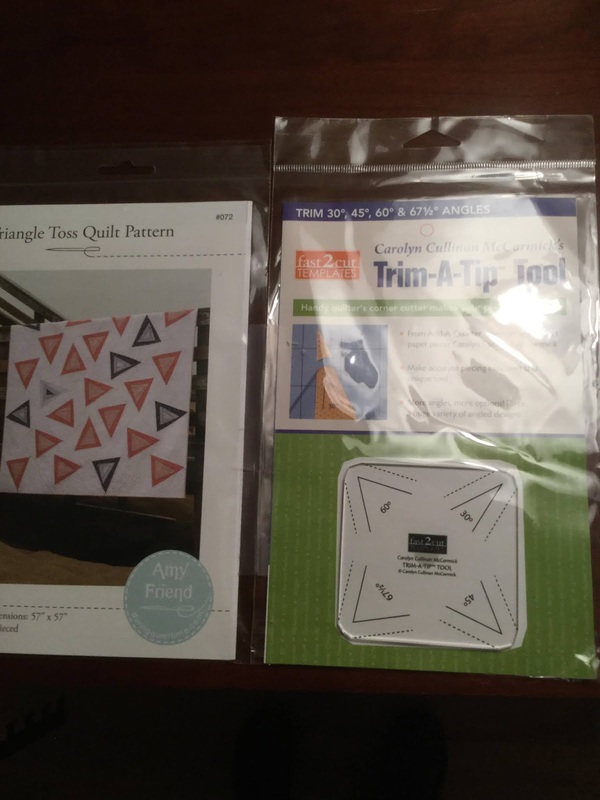 * Raffle #1: Triangle Toss Quilt Pattern with the Trim-A-Tip Tool. * Raffle #2: 3/4 yard of Moda Mon Ami and 3/4 yard of a matching blender! Our October meeting will take place on Tuesday October 16th at 7pm!! Doors open at 6:30 if you would like to come early for some pre-meeting sew-cializing! Programming: Our programming this month will be 3 cool projects that will teach you how to make simple holiday gifts. Sarah, Gail and Carolanne will lead us in 3 demos! Jo Diggs Workshop: We'll be hosting Jo Diggs for a workshop on November 10th at Quilted Threads! Pricing is $65 for members and $75 for non-members. 2019 Board Positions: It's time to start thinking about 2019 board positions! If you would you like to help run the guild next year please reach out to a current board member for more information. October 27th Road Trip: We currently have 7 people signed up for a day of quilty fun! See Lesley or Alison if you'd like to sign-up. Shop Hop: Our first few shop hops were very popular, but they seemed to have fizzled out. Would you be interested in going on one in January? After you've purged all of your fabrics and notions for the yard sale you'll need to shop right?! We'll ask for a show of hands at the October meeting to try and get this planned. Giveaways and Raffles: Our giveaway item this month is perfect for those of us who love to travel with our quilting. 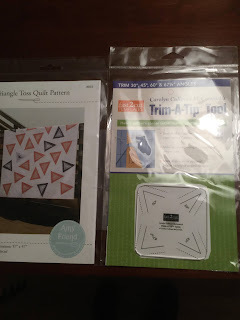 A mini rotary cutter and mat! 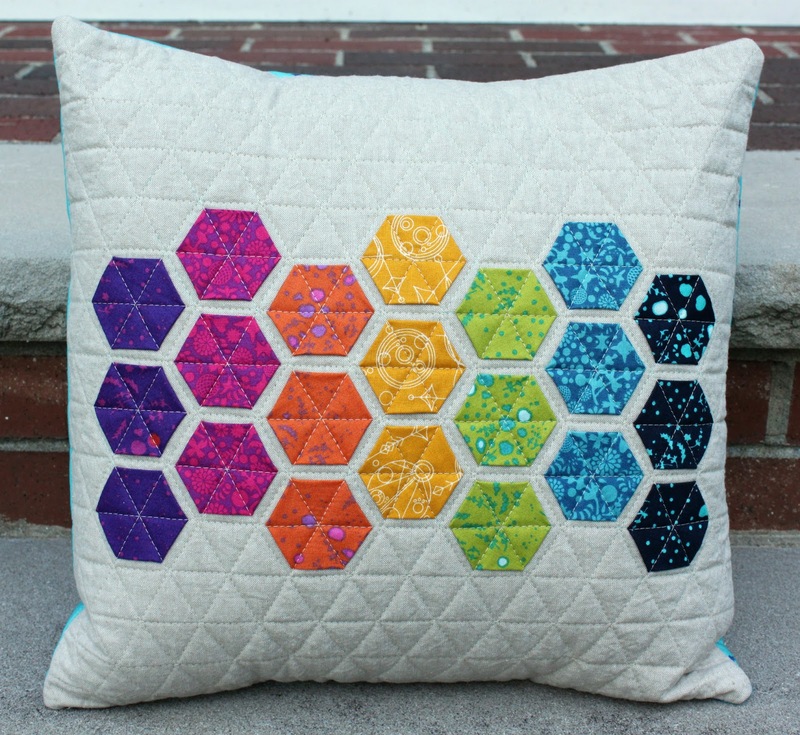 * Raffle #1: Michelle has generously donated the beautiful hexie pillow from the top of this email for our monthly raffle! * Raffle #2: Two and a half yards of Moda Blushing Peonies with 1 yard of matching Kona. We'll see you tonight at the First Baptist Church! Our August meeting was fun with members showing quilts as well as pouches from exchanges. Please note that the recorder did not capture everything (accidentally turned off), so I did not get everyone's names. Many apologies! The Charity Quilt committee has been very busy and productive! Lori showed off one of the charity quilts. This charity quilt was made using jelly roll strips. This charity quilt is incredibly cute with the rabbit panel in the middle. A member showed off quilting done using a decorative stitch! Very interesting idea! We saw some of the results of a pouch exchange among members. Trish's pouch had a very sophisticated fabric and a jewel on the zipper! Patti showed a very colorful pouch! This member was very pleased with her large pouch. Gail showed first panel of her wonky stars panel for the Mighty Lucky Color Challenge quilt. Michelle has been very busy. Great job on this monochromatic HST quilt finish! Finally, Michelle showed off her colorful pouch with strips of flowers! Sarah showed her pouch with lots of interior clear pockets. Very nice! And, the pouch she had made up for her partner in the swap. This is Sarah's latest top with large scrappy blocks. A member showed this stash buster done with strips and selvage edges. René showed her blue hexagon quilt. Very lovely! And she had a second more geometric quilt in the same blue colorway with a lot of visual impact! René showed us a third, colorful quilt with an interesting optical effect! Fun! Chelsea presented this very lovely equilateral triangle quilt with the large triangles highlighted by the grey-ish triangles. Chelsea's second quilt was an intricate pattern with a wide variety of colors. Suzie had two "plus" sign quilts. Lovely! Lastly, another pouch with beautiful floral fabric.